During their parleys in Delhi, Akhilesh and Mayawati apparently arrived at a ‘broad understanding’ to fight on equal number of seats — 37 each — in Uttar Pradesh, leaving six to others. 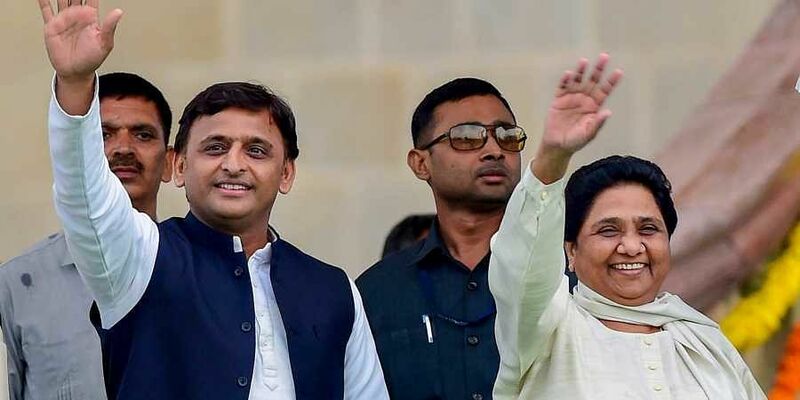 LUCKNOW: The Mahagathbandhan seat-sharing exercise for Uttar Pradesh ahead of the 2019 Lok Sabha elections was confirmed, but the final shape of the alliance could not be thrashed out following Bahujan Samajwadi Party (BSP) chief Mayawati’s insistence on more seats, post a broad agreement to share seats equally at parleys with the Samajwadi Party (SP) in New Delhi on Friday. The BSP is learnt to have indicated that the apportioning of seats — 37 each to lead players (SP and itself) — does not suffice and that SP chief Akhilesh Singh Yadav could, perhaps, accommodate the allies from his own quota. Consequently, a final decision on the structure of the alliance stands deferred till January 15 at least. The larger consensus within both parties is to keep the Congress out of the anti-BJP tie-up, though sources said the final shape of the alliance was “not yet firmed”. The BSP and SP reportedly felt the Congress’ demand for up to 18 seats was not feasible. Uttar Pradesh has 80 Lok Sabha seats, the highest in the country of which, the BJP had won 71 in 2015. Though negotiations for seat sharing between the partners are said to be concluding, the BSP’s hard-nosed bargaining has caught the SP, which is still wary of finally closing the door on the Congress, off guard. A highly-placed functionary in one of the parties said, a formal announcement on the alliance is likely to be made in Lucknow by Mayawati and Akhilesh on January 15 and the Congress seems out of the equation “for now”. During their parleys in Delhi, Akhilesh and Mayawati apparently arrived at a ‘broad understanding’ to fight on equal number of seats — 37 each — in Uttar Pradesh, leaving six to others, of which Amethi and Rae Bareli will be left to Congress chief Rahul Gandhi and UPA chairperson Sonia Gandhi, respectively. Neither SP nor BSP will field candidates in these seats. They also decided that of the remaining four seats, two — Baghpat and Mathura — may be given to the Rashtriya Lok Dal, while other two will be kept aside to accommodate prospective allies like OP Rajbhar’s Suheldev Bharatiya Samaj Party (SBSP) and Apna Dal (Krishna Patel), if they join the alliance. Notably Rajbhar, a minister in the Yogi cabinet has expressed his desire to leave the NDA. SP and BSP reportedly felt they could not give the Congress more than two seats. But an SP leader said Akhilesh is in ‘constant touch’ with Rahul Gandhi.